We are forced to pay attention to the name "Aurora," over and over again. First, a discovery, recently made. So last night my wife and did our usual dinner in front of the tv routine watching 30 Rock. We've been watching it for the first time and last night's episode caught my wife's eye for the Copycat Effect. We were watching Season 6, Episode 7: "The Tuxedo Begins," which first aired February 16, 2012. "I'm going to the movies. ... I am sick; sick like a fox. I'm going to clear out that whole theater and watch a sneak peak of The Hunger Games by myself. It'll be my greatest triumph." My wife and I both freaked a little as we verified the air date for this episode as having preceded the Aurora Shooting. On the other hand ... this series ran on NBC and the whole episode is a spoof of the Batman franchise (titled after the 2005 Batman Begins title) obviously done for the run-up to the 2012 release of The Dark Knight Rises. Footnote: "The Tuxedo Begins" was the 111th episode of 30 Rock. 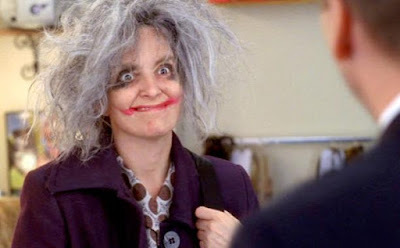 The relationship between Batman and the Joker is referenced, with Liz's anti-social and chaotic behavior reflecting the Joker (made apparent by her crazy-old-woman eye shadow and lipstick applied in a way that parodies the villain, as well as her purple coat and green sweater vest) and Jack's character reflecting the secluded superhero dressed in a tuxedo. Harsh blue and red lighting works to give some scenes a comic book feel. The episode title, "The Tuxedo Begins," is a reference to the movie Batman Begins while the superhero name, The Tuxedo, references The Shadow, also played by Alec Baldwin. Source. The latest name game for Aurora was also played out on September 24, 2015 - the same day Lewis and his wife was making their old 30 Rock discovery - when a Ride the Ducks vehicle in Seattle, Washington crashed into a charter bus on the Aurora Bridge. The incident killed five passengers on the bus, critically injuring eight, and seriously injuring eight more. 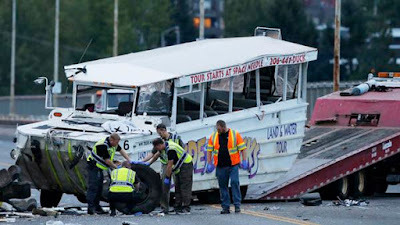 Federal investigators said Sunday, September 27, 2015, that a Seattle duck boat that crashed into a charter bus Thursday, September 24, 2015, did not have an axle repair that had been recommended for some of the amphibious vehicles two years ago. It was also announced that a fifth international college student died from injuries suffered in the crash. Harborview Medical Center said late Sunday afternoon that a 20-year-old woman had passed away. Her name was not immediately released. She had previously been listed in critical condition. The vehicle involved in the Seattle crash was an Army surplus craft built in 1945. It was refurbished with a General Motors engine and chassis in 2005. Witnesses described seeing the duck boat's left front tire lock up before it veered into the bus on the Aurora Bridge, and federal investigators announced Saturday that they found the duck boat's left front axle sheared off -- though they said it wasn't clear if the axle had broken before or after the collision. The five who died in the crash were among about 45 students and staff from North Seattle College who were on the bus on the six-lane bridge with no median when the tourist-carrying duck boat swerved into it. More than 50 people were taken to hospitals. At least 13 people remained at Seattle hospitals Sunday, with four in intensive care and one in critical condition. The amphibious vehicle tours are offered around the world, including in Philadelphia; Austin, Texas; Miami; Fort Lauderdale, Fla.; and London. They feature former military landing craft repurposed as tour vehicles. Source. h/t Michael Schacht & Robert S.
Auroras have a way of turning up, see a few examples, here, here, here, here, and here. See also, "Understanding Aurora As A Synchromystic Fortean" and "The Man Who Predicted The Aurora Shooting." The first "duck tour" company was started in 1946 by Mel Flath and Bob Unger in Wisconsin Dells, Wisconsin. Flath's company has changed ownership since, but is still in operation under the name Original Wisconsin Ducks. His family continues to operate a duck company called the Dells Army Ducks in the Wisconsin Dells Area. Thirteen deaths: In May 1, 1999 a DUKW sank in Hot Springs, Arkansas, killing 13 of the 20 people on board. Four deaths: On June 23, 2002, the Lady Duck, a custom-built vehicle converted from a Ford F-350 pickup truck, sank while a cruise on the Ottawa River in Ontario, Canada. Six passengers, the driver, and the tour guide escaped, but four passengers were trapped under the sunken vehicle's canopy and drowned. A review found problems with regulating such vehicles and defects in the makeshift design and the emergency procedures. Two deaths: On July 7, 2010, a regulated and modern Ride the Ducks amphibious bus (based on the original design), was disabled by an engine fire and later run over by a barge on the Delaware River in Philadelphia. The operator of the tug pushing the barge was on his personal cell phone. Before the accident the Ride The Ducks captain made numerous calls to the tug to get the tug to change course. Those calls were heard and rebroadcast by other vessels, but there was no response from the operator of the tug. Thirty-three passengers and two crew members were quickly recovered, but two passengers, a 20-year-old man and a 16-year-old girl, both part of a tour group from Hungary, were killed. The NTSB determined that the probable cause of the accident was the Tugboat mate's (responsible for driving the tug at the time) inattention to his duties. The tugboat mate was sentenced to 366 days in federal prison. Four injured: On September 5, 2010 a bearing collapsed on a DUKW belonging to The Yellow Duckmarine which resulted in four passengers, including an 80-year old person, being taken to hospital with injuries. One injured: On October 11, 2011 a motorcyclist was critically injured after a Seattle "Ride The Ducks" vehicle hit and dragged him at a red light. Ride The Ducks has been involved in two other collisions in recent years, in December 2010 and June 2011, when different Duck drivers rear-ended passenger vehicles at Third Avenue and Pike Street and at Aurora Avenue North and Denny Way. No one was injured, but both Duck drivers told officers they didn’t see the cars because of the height of their own vehicles, according to the collision reports. Twenty-seven injured: On March 3, 2013 a duck boat of The Yellow Duckmarine in Liverpool sank in the city's Salthouse Dock during a tour. All passengers were safely transferred to a pontoon before the vehicle began to sink. In June 2013 another duck boat, operated by the same company, sank in the Albert Dock as it came to the end of a tour of Liverpool. Passengers were forced to jump into the water as the vehicle rapidly took on water. Some were rescued by vessels while others swam to the side of the dock. Out of the 31 people on board, 27 were treated in hospital for minor injuries. The incident resulted in the Maritime and Coastguard Agency withdrawing all safety certificates for the craft owned by Pearlwild and their entering administration. Pearlwild are also under investigation by the North West Traffic Commissioner over the operation of the Duckmarines during 2012. Unknown injured: On September 29, 2013 a duck boat on the River Thames in London caught fire. Thirty people were rescued, a number of them after having jumped into the River Thames to escape the fire. Five deaths, 16 injured: A Ride the Ducks vehicle in Seattle, Washington crashed into a charter bus on the Aurora Bridge. All the deaths were on the bus. This bridge accident/closure and also the closure of the Hood Canal Bridge a week prior both effected me personally because I had family directly inconvenienced by them. One curious aspect is that the crash was caused by a WWII surplus "landing craft". A few more syncs with this. Aurora=dawn, goddess of dawn. 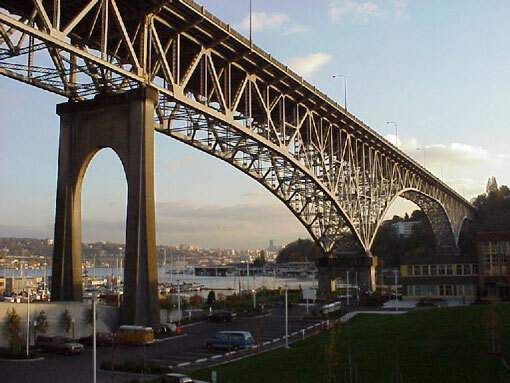 The bridge connects North Queen Ann with Fremont crossing over Lake Union. Queen Ann was queen of England at the time of the Acts of Union, uniting England and Scotland in 1707. Fremont= <Fr freedman. The accident occurred at the time of the Pope's visit to the U.S. Pope=Pontiff=ponteff < Latin for "bridge-builder. Bridges=symbols connection between different planes, times. Amphibious creatures hold a kind of dual magical power over both land and sea. Book of Revelation has an angel with his right leg on sea and the left on land. This angel has a rainbow on his head. Rainbows symbolizing the celestial bridge between heaven and earth.